Bible Time update for Delta - being circulated now. If for any reason you have not had an update please liaise with H.Q. NB Please check first that you have registered your resource pack with HQ as this may be the reason if you have not had any updates as yet. Over the last few years the Crosstrax and Delta groups at St Peter’s Harold Wood have been sponsoring a youngster in Uganda. They have been doing this through Christian Hope International (LINK HERE), a home grown organisation that started at our church some years ago as Containers of Hope and has developed from there. We sponsor Gerald who attends the Kijjabwemi Project at Masaka in Uganda. He is aged 15 and recently went up to secondary school and would like to be a doctor when he is older. ... the cakes were brilliant! Funds to support Gerald have been raised in a number of ways over the years but for 2010/11 they held a Coffee Morning and Nearly New Toy Sale in early October 2010. The planning for this was undertaken by the Delta group as a part of their Volunteering Section of the DofE Bronze and Silver Awards that they are working towards. There was also a display of the Expedition Practice that some of the group had undertaken for their Bronze Award. The event went well and just over half was raised towards this years total! Eight of our Delta Group undertook the Bronze Expedition at the end of the summer holidays 2010. For most it was their practice, although for Nathan it was his Qualifier. As under the DofE no more than 7 can work as a team on the expedition they worked separately in two teams. Nathan has provided the following commentary which we thought we would share with you so that you can see some of the things we get up to in Delta at Harold Wood. Others have contributed to this and made minor changes to clarify some points. “Our objective was to travel 15 miles over two days, to and from the assigned destination at Kelvedon Hatch near Brentwood. We carried out our objective independently, and each member of the group took their turn at, amongst others, map reading, compass reading, time management and other basic orienteering skills. We were fortunate to have good weather this year, it was better than last year which had made the task more difficult in the cold, wet weather. We started the walk at 10:30 in the morning from a lane in Warley and we arrived at the Camping and Caravan Club site at 4:30 in the afternoon, having travelled just over 7 tiring miles. Our rucksacks contained food, drink, parts of a tent and a sleeping bag, however on top of that you also had snacks, maps, compasses and other items that might be needed on the journey such as torches, First Aid kit or a whistle if you got injured or lost. After we had pitched our tents we then set about cooking our meals which were welcome after the long journey. Most of us slept well but others didn’t as the night was quite chilly. We woke quite early the following day and had a cooked breakfast before returning towards Harold Wood, finishing at Tylers Common in the early afternoon. The youngsters all worked very well as a team on this outing, it was good to see them sharing the exercise and seeming to benefit from it. As a group from St Peter’s it was great to see the fun and fellowship they enjoyed. Contributions from: Nathan, George, Fraser, Ben, Deborah, Joel, Alex, Tim. New programme resources for Eagles and CrossTrax were circulated to local Centres at the end of 2009. The resources for Junos were distributed to leaders who attended our Thanksgiving Service and Meal on 23rd January. Area Leaders were present at the national event and many collected the resources for groups in their area. Delta Resources were distributed to local Centres by Area Leaders at the end of 2010: if you are still waiting for yours please contact your Area Leader to arrange collection. All of the resources contain Bible Time materials, games and various forms of activities and projects. These are all age specific and appropriate to each of the four sections we provide. In May 2010 one of Campaigners’ new Areas, Home Counties East, held their Games afternoon at Belhus Park Chapel, South Ockendon. Unfortunately the afternoon was wet, like so many in the spring. 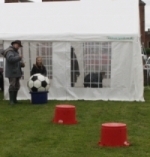 Numbers attending were down, probably because of the weather, but those who came had a good time playing a selection of games: things like splat the rat, tin can alley, goal scoring, target shooting, parachute games, obstacle etc. It also involved dodging the rain! Our afternoon ended with an excellent Bible Time presented by Malcolm MacKinnon who painted pictures of several events from the Bible and used them to illustrate his talk on Faith, how without it is impossible to please God but with it we have the certainty of knowing God and a relationship with Him. Thank you to all of the team from Belhus for hosting this event, it really was appreciated! With our Evangelical and Biblical roots the Trustees recently agreed that we would renew our membership of the EA from 2010. It is an excellent organisation which will provide support of and representation for Campaigners England and Wales. Their aims and objectives are very much in line with ours. "The Alliance speaks on behalf of its members and represents evangelical concerns to Government, the National Assemblies, the media and key decision-makers. In resourcing its members and encouraging Christians to fully engage in their communities as responsible citizens, the Alliance strives to make evangelical truths publicly accessible." After the winter weather that hit the Country just before Christmas and then stayed with us for five or six weeks it was great to be able to go ahead with this event. It was good that many of those who wanted to join us for the day were able to make the sometimes lengthy journey to Coventry. Everyone received a warm welcome to Christ Church, Coventry: there were drinks and nibbles and for some the newly released Junos resources. As we made our way into church there was a video of last summer's camps and then Rev. Frank Seldon welcomed us all to Christ Church for the service which was hosted by the Friends at Coventry. The readings were from John 3 vv 14 - 18, Isaiah 40 vv 30, 31 and Hebrews 12 vv 1,2 read by three members of the HQ Executive Committee. We're not sure who holds the record for the longest journey but we were pleased to be able to welcome Rev. Brian Boyd the Chairman of Campaigners Northern Ireland who came across for the Service, but were sad that Rev. Vince Jennings the Chairman of Campaigners Scotland was unwell and not able to share in the day. However John Bartholomew who lives on the Island of Mull stood in for Vince in representing Scotland. We were all encouraged to hear how God is Blessing the work in those Countries. Graham Payne shared news of how God has Blessed the work in England and Wales. Looking back over the last few years and how God has led us forwards in that period. This was followed by two presentations, one to Pat Kingston for her work over the formation of the new organisation and Yvonne Downs for the many years she managed the D of E Award within Campaigners. As this was the first meeting of Campaigners since re-organisation, the opportunity was taken to re-dedicate the leadership: representatives took part in the service but all Leaders and Supporters joined in to pledge support for the work of CEW by prayer, whether that work was in local groups, at camps or nationally. Edwin Sowerbutts led in a time of Prayer. The talk was given by Graham Bibby from All Saint's, Crowborough who looked back to the roots of Campaigners and then spoke on Hebrews 12 looking back to his time in Campaigners but also looking at our journey through life. Comparing it to a marathon rather than a sprint, and the importance of being where God wants us to be. He also looked at Hebrews 11 and Faith, how it has been moulded by others, down through the ages and in our own time. But our perfect example is still seen in the Lord Jesus. .... we then adjourned to the Church hall for our time of Fellowship over a meal. During our time there we had a fashion display of the new uniforms that we now use. Recordings (CD/DVD) of the service are available, if you would like a copy please contact the office using the link on the CONTACT US page. Disks are available f.o.c. but a donation of £1.50 is invited as a contribution to p&p. Following approval by HQEC the newly revised edition of the Leaders Manual was circulated recently. The document is intended to supplement the Programme Resources already issued to leaders. If any Leader has not received their copy, please contact H.Q.